The capture of Quebec from the French by Wolfe in 1759 sealed the possession of Canada by the British. Wolfe's death in the hour of victory sealed his status as a national hero. Engraving by William Woollett, c.1776, after Benjamin West's "Death of General Wolfe." The other side printed with a ship flying the British flag. 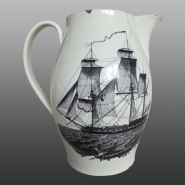 Jug printed in black in Liverpool with "The Death of General Wolfe" after Benjamin West, signed "R. Walker Sculp." [sculpsit. i.e. engraved it] and "I Johnson Liverpool". The engraver Richard Walker is recorded at various Liverpool addresses between 1790 and 1808. Joseph Johnson is thought to be a potter of that name who worked at Newburgh some 15 miles from Liverpool.